DOCX is the file extension for a Microsoft Word Open XML Document file. This word processing format was introduced with Microsoft Word 2007 as part of Microsoft Office 12. The DOCX file is different from the previous Microsoft Word programs, which use the file extension DOC, in the sense that whereas a DOC file uses a text or binary format for storing a document, a DOCX file is based on XML and uses ZIP compression for a smaller file size. In other words, a DOCX file is a set of XML files that have been compressed using ZIP. The need was seen for a change from a binary file format to an XML format when it was found that the previous format was unable to meet the latest challenges like moving data between different applications and collecting information from them. Now with the newer XML based DOCX file it has become much easier to work because of its ability to be read by different applications, platforms, and internet browsers. Now the application does not have to be part of the Microsoft Office system to be able to function. Any application that supports XML can now work with the new file format. Other than this, security concerns have also been minimized as XML can easily pass through firewalls. Sending and receiving files has also become easy as DOCX files are much more compact and robust. The main program used to open DOCX files is Microsoft Office Word 2007 (and above). Older versions of Microsoft Word cannot open DOCX files. To avoid this problem, the newer Word has made it possible to save a file in the previous DOC format instead of the default DOCX. This makes the file compatible with all versions of Microsoft Word. It is also possible to convert a DOCX file into another file type by opening the file in its default program and then saving it in another file format. Other programs that open DOCX files include Panergy docXConverter, OxygenOffice Professional, OpenOffice.org with Odf-Converter, NativeWinds Docx2Rtf, and Apple Pages (with iWork '08 or later). 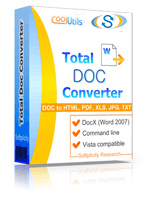 If you want to open DocX in your old Office Total Doc Converter can convert DocX to Doc or TXT. It also converts DocX files to PDF, HTML, TIFF, JPEG for your convenience. Get your 30-day free trial here.